It is increasingly acknowledged that the consequences of climate change will affect both existing and new seaport and inland waterway infrastructure. Adaptation (to reduce vulnerability or increase resilience) will therefore be necessary. Despite an increasing number of countries having developed National Adaptation Programmes of Action, in many cases including sectoral assessments, this work has not typically been shared widely, and there is a lack of practicable catalogues of adaptation options for port and navigation infrastructure. In order to respond to this challenge and to provide guidance to port practitioners and infrastructure developers, the World Association for Waterborne Transport Infrastructure (PIANC) established in 2015 its Working Group 178 on Climate Change Adaptation. This Working Group comprises more then 20 experts from around the world. The scope of the guidance being prepared extends to all aspects of maritime/estuarine and inland port and waterway infrastructure. It covers a range of day-to-day activities such as the management, operation and maintenance of infrastructure, conservancy, dredging, pilotage and engineering. It is also considering possible climate change implications for the design and construction of new development projects and it reflects on interdependencies such as hinterland connections. The foreseen outcome is a useful, well-structured and practical guidance designed to support climate change adaptation decision-making in the ports and navigation sector. 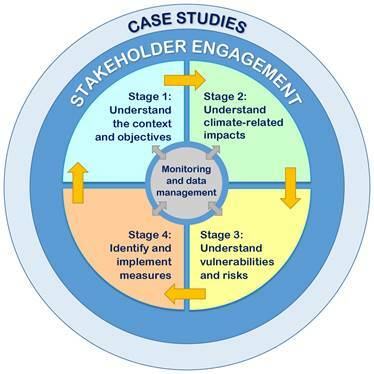 The guidance includes sections on awareness and stakeholder engagement, understanding the climate science, risk assessment, option evaluation and selection, and monitoring. Templates to help in identifying relevant stakeholders, preparing an inventory of climate-vulnerable infrastructure assets and operations, and determining monitoring needs have also been prepared. The WG has explored the range of climate change adaptation options for maritime and inland port and navigation infrastructure and has compiled a portfolio of measures. This includes non-structural (management) and institutional as well as structural options. As part of the development of this guidance, workshops were held in Norway, the UK, the USA, The Philippines and South Africa: reports of these workshops will be made available as part of the published guidance, along with an Annex of case studies from around the world, illustrating good practice in addressing a range of climate-change related challenges.